Scheduling a meeting with multiple people outside of an enterprise has always been a time drain; at least until the entry of Approved Contact. While communication requires at least two participants, digital calendars—which ought to assist with the streamlining and scheduling of it—tend to be siloed and single-user facing. When it pertains to B2B communications, sharing enterprise-e-mail domain bound calendars in the open is not advisable either. Helping enterprise users off this predicament, by enabling them to create a safe, shareable view of their calendar, Approved Contact offers an intuitive visual calendar that saves individuals from being bombarded by untimely interruptions and ‘meeting requests’. As its brand name implies, Approved Contact serves as a secure platform for users to share files and conversation while they collaborate with other ‘approved’ companies. Contacts outside of a user’s enterprise can see their availability. Any changes that the user makes to their calendar are automatically updated on the Approved Contact interface. In addition to supporting every major calendar system, the Approved Contact calendar can even be easily linked to e-mail signature blocks. Users can compare each other’s contact times making scheduling easy in a matter of a few clicks. 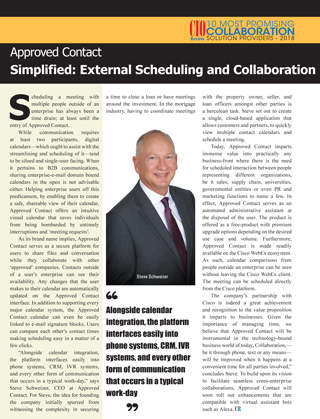 “Alongside calendar integration, the platform interfaces easily into phone systems, CRM, IVR systems, and every other form of communication that occurs in a typical work-day,” says Steve Schweizer, CEO at Approved Contact. For Steve, the idea for founding the company initially spurred from witnessing the complexity in securing a time to close a loan or have meetings around the investment. In the mortgage industry, having to coordinate meetings with the property owner, seller, and loan officers amongst other parties is a herculean task. Steve set out to create a single, cloud-based application that allows customers and partners, to quickly view multiple contact calendars and schedule a meeting. Today, Approved Contact imparts immense value into practically any business-front where there is the need for scheduled interaction between people representing different organizations, be it sales, supply chain, universities, governmental entities or even PR and marketing functions to name a few. In effect, Approved Contact serves as an automated administrative assistant at the disposal of the user. The product is offered as a free-product with premium upgrade options depending on the desired use case and volume. Furthermore, Approved Contact is made readily available on the Cisco WebEx ecosystem. As such, calendar comparisons from people outside an enterprise can be seen without leaving the Cisco WebEx client. The meeting can be scheduled directly from the Cisco platform. The company’s partnership with Cisco is indeed a great achievement and recognition to the value proposition it imparts to businesses. Given the importance of managing time, we believe that Approved Contact will be instrumental in the technology-bound business world of today, Collaboration,— be it through phone, text or any means— will be improved when it happens at a convenient time for all parties involved,” concludes Steve. To build upon its vision to facilitate seamless cross-enterprise collaborations, Approved Contact will soon roll out enhancements that are compatible with virtual assistant bots such as Alexa.